Simply Sovann: Pop of Color? What is everyone favorite staple piece of the summer? Do you guys think that bright color will always be in for the summer? I think this is always stand true since we seem to revert back to that trend every spring/summer whether with design and texture incorporation. So, I love bright color for the summer and i think everyone ought to own something bright whether it is a shirt, short, accessories, and so on. For me, I wanted to get me a pair of bright pump to spice up my outfit, and I was thrill to run across this amazing heel. If i have not mention this before, I am a subscriber to M'ODA 'OPERANDI. Do not ask me how to pronounce that because I don't have a clue. Anyway, they always send me emails constantly about any new fashion show and so on and they just have amazing heel in their website. 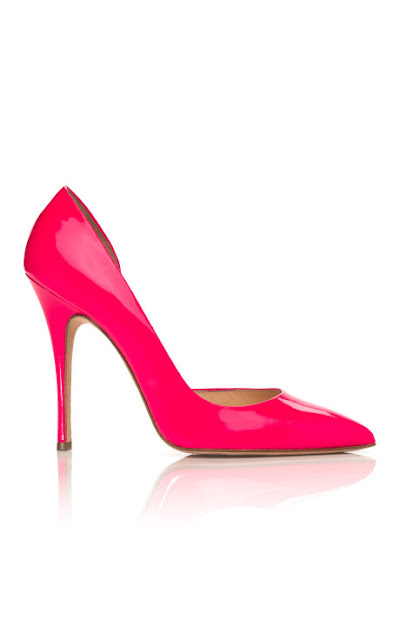 The heels are amazing and they are super bright! In fact, I am going to let the picture do its own justice. Good night everyone!